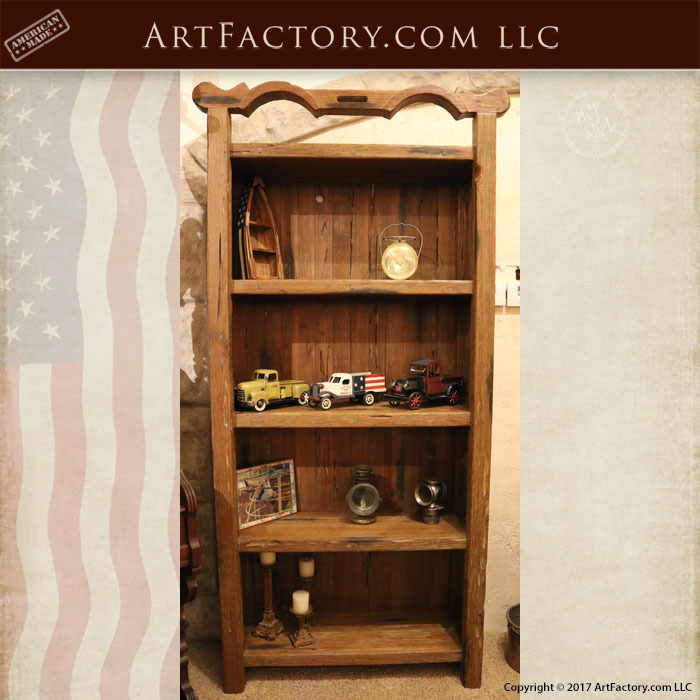 This custom designed, rustic handcrafted wooden bookcase from ArtFactory.com can be customized for your residential of commercial office. It can be ordered by itself, or as a companion piece with our rustic executive office desk. You can even make it a full office with our rustic executive filing cabinet. Perfect for any lodge or log style office, and can easily be converted to Western or any other style that you choose. Like all of our products, it is available in any size style or finish color. Each product is custom made to order and fits the personality of each client. Sometimes the hand carvings are copied to the design of other fine art collectibles or it may be art taken from personal photos, coats of arms, or something that has family meaning. The rustic handcrafted wooden bookcase is hand hewn, mortise and tenon joined. The decorative top as shown features a fully detailed and master hand carved oxen yoke design. The rustic handcrafted wooden bookcase as shown features four 1 3/4" thick solid shelves. It is shown in a flat matte finish designed to appear rustic and old. Like all of our wood products it is finished using our proprietary fine art finish process as detailed below. This handmade bookcase has a finely sanded, snag, and splinter free surface. It is finished on all sides, both inside and out. This is a fine art quality certified design by award winning artist H.J. Nick. It is built under the supervision of and signed by H.J. Nick as meeting all world class fine art qualifications. This assures of an investment quality product that will have future appreciable value as an antique. Our custom office furnishings are available in any size, style, and finish by our American craftsmen. Each is handmade using old world techniques to create a luxury furnishings for your project. We offer the finest custom furniture available anywhere at any price. We are so confident in the quality of our products and craftsmanship that we guarantee everything forever. Further customize your solid wood desk with hand carved designs, custom hardware, or granite tops. The choices are endless when you order your custom office furniture from ArtFactory.com. Call us for pricing on the rustic handcrafted wooden bookcase at 1-800-292-0008.